Imagine the continuous breaking of ocean waves on a sandy shore as the orange sun slowly dips into a distant golden glow. 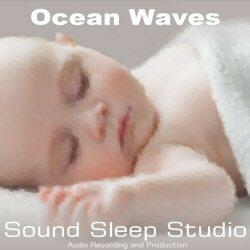 Ocean waves provide a natural source of relaxing soothing sounds to help your baby gently fall asleep. It is one of nature’s natural white noise sources and provides a simple soothing calming and wonderfully relaxing sound. It you are not fortunate enough to have easy access to the beach, our Sleep Sound Baby Ocean Waves sound provides all the benefits of listening to the original natural sounds of breaking waves but in the comfort of your own home. We have digitally captured the true sound of a ocean to provide a high quality environment changing recording. Ocean Waves is available as a simple MP3 download. The MP3 can be played directly from your computer or via any MP3 player. You can be playing this soothing sound to your baby in just a few minutes and embark on a journey of more relaxed sleep times.